Scottish Premier League player of the month Keith Lasley says Motherwell are not letting second place go to their heads as they prepare to face Celtic. 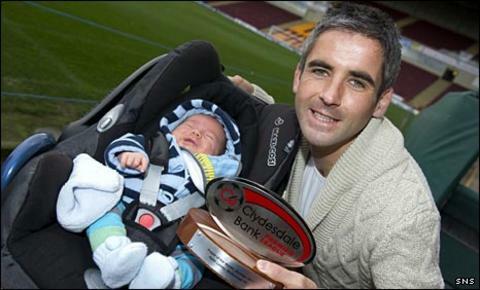 The 32-year-old received his Clydesdale Bank award for October after helping his side win three and draw their other game during the month. "It's not something we are focused on, put it that way," he said ahead of Celtic's visit to Fir Park on Sunday. "You don't come in every day and think, 'we are going to finish second'." Motherwell are three points ahead of Celtic, although the Glasgow side have a game in hand, a position that has surprised Lasley. Asked if he thought they could maintain that position, the midfielder admitted: "No, not really. "Historically, it has been shown that clubs have split the Old Firm for so long and then, for whatever reasons, they have fallen away. "You always think you are capable of doing it, but we have been a bit shocked at the consistency and still being in second place at this stage. "I think, if you would have asked any of us at the start of the season if would we be in second in November, being realistic, we would have said we would be hard pushed to get there. "But we are and it is through hard work and good play." Lasley does not think that the mounting pressure on Celtic manager Neil Lennon, whose side are 12 points adrift of reigning champions Rangers, will affect the way Motherwell approach this weekend's game. "You are always aware that Old Firm managers are always under pressure," he said. "We are focused on what we are doing, that is all we are in control of." Lasley scored in a 3-1 win away to Dundee United and a 3-2 victory over Inverness at Caledonian Stadium - one of three wins on their travels during October, the other being against Hibernian. His joy was heightened during October by the birth of his son, Alfie, and believes he is in the form of his life. "Getting accolades like this is nice and means you must be doing something right," said the midfielder, who is in his second spell at Fir Park, having left for a two-year stint with Plymouth Argyle before returning to Motherwell in 2006. "It has probably been the best spell of form in my career. "I have managed to add a couple of goals to my game this season, which I haven't managed consistently enough during my career. "I am feeling better than ever and enjoying my football more than ever, so maybe that is showing."